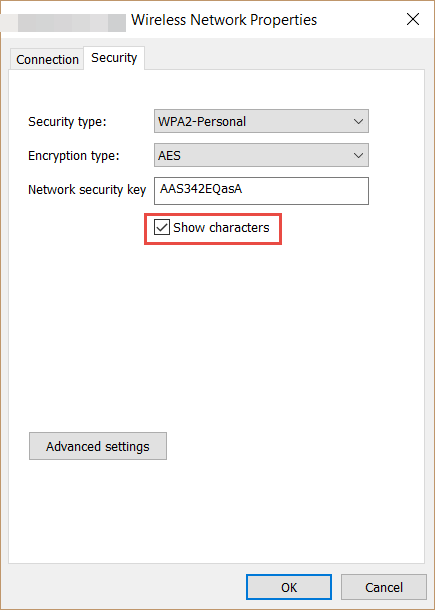 The easiest method of finding the WiFi Password of your active connection is to use the Network Center in Windows 10. The Network Center shows all active connections including your WiFi one and makes accessing the properties of your current connections a lot easier. 1. Click on the WiFi / Network icon in the taskbar and then choose Network and Sharing Center -or- Open Start and type Network and Sharing Center, then choose Network and Sharing Center. 2. Then click on your active network connection, as shown in the image below. 4. Once your Network Properties window is shown click on the Security tab and then check the box Show characters. The passphrase of the current Wi-Fi connection will now be shown to you. If you don’t have this option then your connection might not be secured or your connection is using another way of verification who is trying to connect. Enterprises, for example, use Windows login information to verify who is trying to connect to their network and in most cases do not use a passphrase. If you are trying to connect to a corporate network connection which does not use a password phrase then we suggest you contact the IT Department for more help. You can also use netsh to see the password of your current or other network saved on your system. If you are familiar with Command Prompt and Shells then this might just feel better for you since it has more options then the Network and Sharing center does. If you are just a regular Windows user we recommend you try the above method to find the wifi password in Windows 10. 2. Type the following command in the command prompt window, replace WIFINAME with the name of your current WiFi connection. If your network connection has space in its name then add quotes for example “WindowsInstructed WiFi Network”, if it does not contain spaces then there is no need for it. 3. You will now see all information about the network you’ve chosen as shown in the image below. You’ve reached the end of our tutorial on how to find the WiFi password in Windows 10. We hope this guide has sucesfully helped you to find the passwor / passphrase.